Some people worry that using treats during training will cause their horse to become pushy, nippy and turn them into a horrible food monster! Unfortunately this is likely if your horse doesn’t learn how to behave around treats. 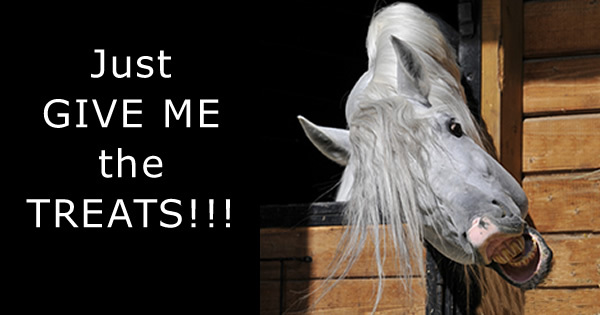 For most horses food is their favorite thing and they just want some… NOW! Thankfully it is easy to teach your horse to have perfect manners around treats. Would you like to know more about your horse’s personality? Is your horse an Extrovert or Introvert? Right or left brain? And does this relate to the whorls (swirls) on their face? 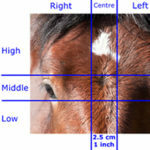 I am currently researching the connection between a horse’s facial whorls and their personality. If you want to teach your horse lots of tricks you need to clearly define the start and end of your training sessions. Your horse needs to know when you are about to start teaching them something new and to give you their total attention. To signal to my horses that I am in training mode I wear a Treat Bag around my waist. This bag is a great place to store treats and it has a spring that holds the bag open so I can easily get to the treats. But best of all… if I’m wearing the treat bag my horses know we are going to do some trick training and to pay attention. Even if it’s just a quick 5 minute session. You can use other ways to signal the beginning of a trick training session. For example you could put a particular halter on your horse or train in a certain area reserved for learning new things. If I am wearing a Treat Bag my horses really come to attention and watch every movement I make. If you build a bond with your horse through trust and communication, they will do just about anything for you. 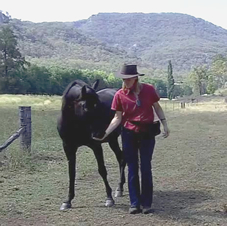 A few days ago I was training Bella (my new trick horse) in her new paddock. I’m always looking for opportunities and new things to do with Bella. There were lots of flat rocks around. I thought it would fun to ask her to stand on one. She’s never stepped UP onto something for me but we have been practising walking onto a mat. 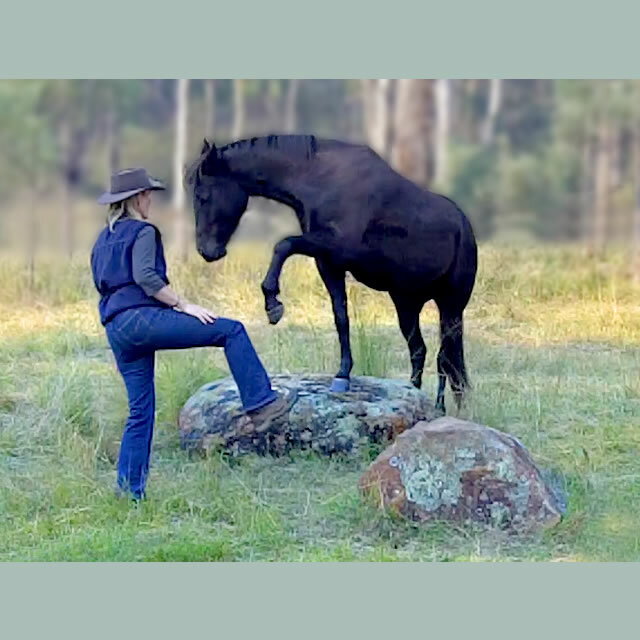 Would you like to teach your horse a trick quickly or slowly? I think you would probably say ‘quickly’. Who wouldn’t? But I’ve found that teaching horses tricks slowly actually speeds things up. If you want to teach your horse to bow it’s easy – just grab a carrot, put a halter on your horse and without letting your horse step backward, tease them between their front legs with the carrot until they lower their head. There are loads of websites that show you how to do this. 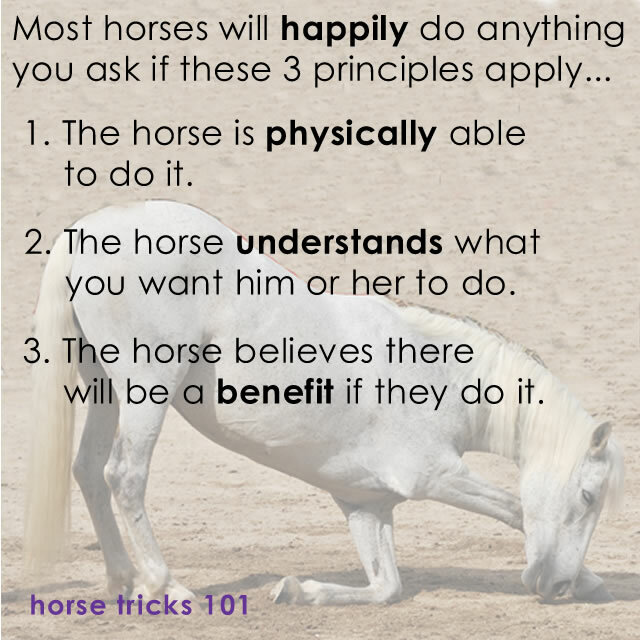 Your horse hasn’t really learnt anything (except how to bend into a funny position to try and get a carrot). If you want them to do something more complicated or a movement that can’t be taught by following a carrot then you won’t stand a chance with this method.